Bermaz Auto Philippines Inc. (BAP), the exclusive distributor of Mazda vehicles and parts in the country, reported record sales numbers for the month of December and the full year of 2017. The 2017 full-year sales result of 5,244 units represents the company’s best sales year since taking over the Mazda distributorship 5 years ago in 2013. In 2012, the year prior to BAP, a total of 1,414 units were sold. The December 2017 sales registration of 1,006 cars, SUVs, and trucks was also the best-ever monthly sales performance for the brand. 9 out of the 12 sales months in 2017 were the highest on record since 2004. The Mazda2, Mazda6, CX-3, CX-5, CX-9, and MX-5 nameplates enjoyed their best-ever sales year in 2017. 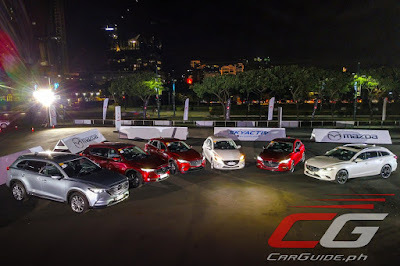 Mazda2 sold 1,485 units. This means that since its introduction in 2015, it has gained popularity steadily thanks to its generous equipment and advanced technology. MX-5 sold 246 units, enjoying its best year in 2017. CX-9 7-seater crossover moved 191 units despite being on-sale starting just in Q4 2017. CX-3 has seen 327 registered releasing meaning this small premium crossover has really taken off since its 2016 introduction. Wala po bang Update sa Mazda about sa Excise Tax? Of course, the car industry enjoyed bumper harvest last year because of the impending excise tax. This year is another story, they will enter famine territory. What about mazda 3 and cx5? I see more mazda 2 and 3's on the road lately.